Few other techniques in the laboratory so exquisitely blend the scientific fields of analytical chemistry, physics, and biology better than mass spectrometry (MS). Put simply, MS is designed to identify, and often quantify, the chemical makeup of a sample by measuring the mass-to-charge ratio of the ions that constitute that sample. This technique holds the key advantage of being extraordinarily more sensitive than other methods that are so often used in laboratory medicine. 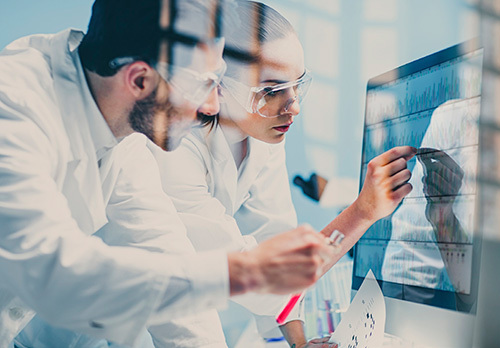 Clinical laboratories are becoming increasingly dependent on MS data within the areas of toxicology, immunology, cancer genetics, and proteomic analysis. A mass spectrometer can be broken down into three main components. The heart of the device is the ion source—this is where electrons bombard compounds within the sample, creating a mixture of charged particles. The particles are then passed along to the mass analyzer, which uses a magnetic field to progressively focus the ions, allowing them to separate according to their mass and charge. Finally, the individual ions are passed down a narrow tube, at the end of which is a detector that senses the charged particles and displays the results as an ion spectrum. Modifying any one of these three basic components can dramatically change the output signal for MS machines, and manufacturers are constantly tweaking their devices to suit the diverse needs of researchers looking to take advantage of varying sample inputs with increased signal output.